Update: The Gregory for US Senate campaign has learned recently of another Republican County Chair that was the target of a bogus email campaign, in this case the emails cast dispersion on the good name of the Ohio Republican Party. Sending such messages i.e., posing as a member of a campaign staff is a violation of the Ohio Revised Code, and is being pursued as such with due diligence. To date, and to our knowledge, these bogus emails have been sent to Republican and Tea Party heads in the eastern half of the state. In some cases the emails have been followed by telephone calls, by someone calling themselves Jimmy Adams or other names. No such person(s) has any connection the our campaign whatsoever, and those who are in the know can ascertain the validity of contacts in the usual way. The Gregory for US Senate campaign staff requests that all Republican County Chairs and Tea Party heads be aware that there is a dirty tricks campaign being conducted and please report the receipt of any communications of an unusual nature to the Ohio GOP headquarters in Columbus. This immoral and illegal campaign casts a negative image on the Republican Party as we approach one of the most important elections in American history. At first glance, Watergate was just one of the many burglaries that are carried out in our nation's Capitol on any given day. But, over the days and months that followed that first impression, gained at a routine night court appearance, was surpassed by the unravelling of a campaign of dirty tricks of ruinous proportions. The unravelling came about due to the tenacity of two rather young reporters. Those involved were found to be members of our intelligence community and of the White House as well as political party staffs, Cabinet members, many lawyers, and some who could only be described as political hit-men. Some, as we now know were active participants, while others would fall from grace because they tried to cover up the involvement of government and the party. It seems that the great state of Ohio has not been spared its share of political shenanigans. Shenanigans is an interesting choice of words actually, as it carries two rather distinct connotations. Shenanigans, can be seen as mischief resulting from often high minded and silly devilish pranks committed by the innocent of mind. Shenanigans can also be defined as dishonest activity cloaked in secret manoeuvrings with the intent to cause harm or damage or both. In this case shenanigans carries the latter and not the former meaning. Here is what is known at this time. An individual, an adult, posed as the member of the staff of a senatorial candidate and made fictitious representations on behalf of that campaign staff to another political organisation. The staff of the senatorial campaign learned of the contact upon receiving a letter from the political organisation concerning a series of requests. In the letter to the senatorial campaign was a name, email address, and two telephone numbers that had been written on the back of a legitimate campaign card by the fictitious representative and handed to a leader of the political organisation at an event at which the senatorial candidate spoke. This individual made it appear that he was a member of the campaign staff, left a card he had undoubtedly been given by a legitimate member of the campaign staff and wrote his name, more properly a name, an email address, and two telephone numbers, and gave it to a leader of the political organisation. Then made a subsequent contact with that organisation, having established himself in their eyes as a member of staff and made representations on behalf of the senatorial campaign. The political organisation with which the senatorial campaign had establish a working rapport then met to consider the bogus requests. The requests were beyond anything that the senatorial campaign would request or that the political organisation would grant. A working hypothesis, one is appropriate here, is that the intent of the bogus representation was clearly to do harm and cause damage to the relationship between the two groups. To what purpose, and was this individual acting alone, or was he acting on behalf of or in association with someone else, others? Who would benefit from this activity? Another candidate, a candidate that had dropped out of the race, the party, the opposition? And, was this an isolated incident or part of a wider campaign of dirty tricks? Having ascertained the long-standing party affiliation of the bogus representative the opposition seems unlikely. Each of these questions is what the investigation that is now underway intends to answer. 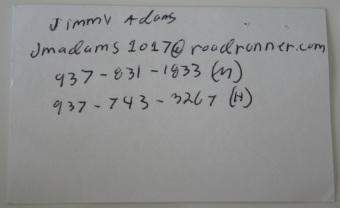 One of the key pieces of evidence was to obtain the card, shown below, on which the name, email address and telephone numbers were written and get that card into the hands of investigators, to obtain physical evidence. Then there is the camera evidence of the route taken to and from the event, which is followed by communications records to establish relationships to any other interested party(s) for this “planned out well” misrepresentation. Elections in the United States of America are the essential ingredient that makes our system of republican liberty work. The right of ordinary citizens to solicit the votes of their neighbours to pursue service to one’s country is the foundation of our Republic, and is to be safeguarded with due diligence. No one has a right to interfere with the election process, no other candidate can by misrepresentation harm or do damage to another, no party member or official can authorise or share in these deeds, and no seated government office holder can turn a blind eye to the shenanigans of their supporters.